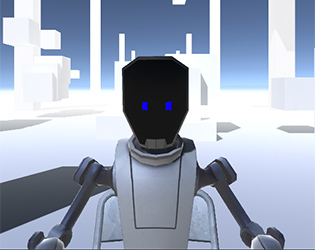 A small demo where the player is seated in the center of the scene, across a companion VRobot. The player will see a little bit of what can be done with VR, without having to be afraid of motion sickness or jump scares. Recommend high end machine. Was made with a Nvidia 980 card and Oculus DK2. Available for PC and (not so recommended) for Mac. This Game requires an Oculus (preferably DK2) and headset. Be seated, play the DirectToRift executable and enjoy! Since this is a prototype, it hasn't been extensively tested. If in doubt, try restarting the game.